Perfect for coffee and tea. Great sweet taste. Trusted Swiss quality. Keep enjoying sweetness, and give up unwanted calories instead. 0 calories. Gluten free. Suitable for vegans. Kosher. 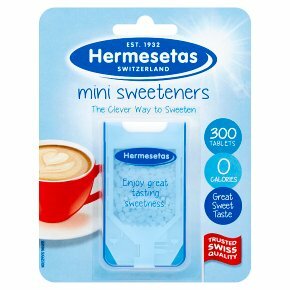 Great tasting and great value premium Swiss quality Hermesetas Sweeteners have been available since 1932. They are trusted and enjoyed as a clever caloriefree way to sweeten food and drinks in over 100 countries worldwide.